Please send suggestions for improvements to this document to E.M..
August 17, 1997; Revised 6/99; 8/00; 8/01; 9/01; 4/02, 2/04, 8/04. Caveat: This history page is far from comprehensive. It was started because of E.M.'s interest in tracing the roots of the free visualization software which became available in the early 1990's, notably MAGE, RasMol and Chime. In particular, it completely omits visualization tools of the crystallographer after 1990 (and gives only spotty treatment to these tools before that time). E.M. has received materials including historic photographs that remain to be incorporated below. Moreover, it omits many other recent free visualization tools with very strong capabilities, such as Cn3D, DINO, PyMOL, Swiss-PDBViewer (aka DeepView), and VMD -- links to which can be found at molvisindex.org. For the first X-ray crystallographic solution of a macromolecule, myoglobin, Kendrew and coworkers (1958) built brass models at a scale of 5 cm/Ångstrom. The models were built and supported within 2,500 vertical rods arranged to fill a cube six feet (2 meters) on a side. Colored clips were attached to the rods to signify electron density, and guide the building of the model. The forest of rods obscured the view of the model and made it hard to adjust. Its size made it cumbersome and problematic to move. The Richards Box, aka Fred's Folly. In the late 1960's, while solving the structure of ribonuclease, Fred Richards and coworkers (1968) introduced an optical comparator that facilitated building a Kendrew-style brass model. Electron densities resulting from crystallographic solutions were printed by computers on paper, and electron density contour lines were traced by connecting numbers of similar values on the paper. These contour lines were then traced onto transparent plates (3 x 3 feet). The plates were mounted vertically, equally spaced, creating a sliced three dimensional electron density map. Half-silvered mirrors were arranged to superimpose the electron density map upon the brass model. As larger molecules were solved, the scale was reduced to 2.5 cm/Å, and then 1.0 cm/Å. In 2001: Several Kendrew-style models built by Michael Rossman's group, including one with a still-assembled Richards Box, are on display in the basement of Lilly Hall at Purdue University, West Lafayette IN US. A Kendrew-style model is on display at the US National Institutes of Health Museum, Building 10 (near the Lipsett Auditorium), Bethesda MD US. This model, built with a Richards box (no longer in existence), represents the Fab fragment of an antibody MoPC603, built by Eduardo A. Padlan in 1974. A Kendrew-style model of chymotrypsin built by Alexander Tulinsky is on exhibit in the main lobby of the Chemistry Building of Michigan State University, East Lansing, Michigan. Getting it there from the room where it was originally built required partial disassembly, because it wouldn't fit through the door. A much more detailed account of this era is available in Michael J. Connolly's Molecular Surfaces: A Review in the Computational Chemistry section of the NetWork Science website. Physical models are discussed especially in the Introduction, and in Part 3: Electron Density Fitting. Wire model of the backbone trace of the I domain of CD11a (from 1LFA.PDB), an alpha/beta domain of a leukocyte integrin adhesion molecule. Alpha helices are decorated with red pipecleaner, while beta strands are decorated yellow. Model generously constructed by Tim Herman in 1997. After Kendrew et al. solved the structure of myoglobin, they built a physical "ball and spoke" model. Eric Francoeur has provided an illustrated account of this era, "A. A. Barker's Models of Myoglobin". Twenty-nine of these models were sold to researchers around the world in the 1960's, manufactured by Beevers Miniature Models, an outfit still offering a variety of protein models today, including custom proteins. Byron Rubin, while working as a crystallographer with Jane Richardson in the early 1970's, invented a machine for bending wire to follow the backbone trace of a protein. (Rubin & Richardson, 1972). In the 1970's, computer visualization of macromolecules was not yet generally available to crystallographers. Kendrew-style models were built on wire supports from projections of the electron density map, from isocontours traced on plates of glass in a "Richards box". These models were large and cumbersome. The small backbone wire models from Byron's Bender were the most manipulable and portable models available at the time. An example illustrating the importance of models from Byron's Bender occurred at a scientific meeting in the mid 1970's. At this time, less than two dozen protein structures had been solved. David Davies brought a Bender model of an immunoglobulin Fab fragment, and Jane and David Richardson brought a Bender model of superoxide dismutase. While comparing these physical models at the meeting, they realized that both proteins use a similar fold, despite having only about 9% sequence identity. This incident was the first recognition of the occurrence of what is now recognized as the immunoglobulin superfamily domain in proteins that are apparently unrelated by sequence. The insight was published in a paper entitled "Similarity of three-dimensional structure between the immunoglobulin domain and the copper, zinc superoxide dismutase subunit" ( Richardson et al., J. Mol. Biol. 102:221-235, 1976). Byron's Bender remained available through the 1990's. Tim Herman of the Medical College of Wisconsin was one of its last avid users. Tim brought the Bender into local high schools and taught teachers and groups of students how to construct models. Herman's web site has photos of many beautiful wire models, as well as more on the history, technology, and source of Byron's Bender. Aside from the importance of the tactile as well as visual input these models provide, another of their great strengths is that they jiggle and vibrate when fondled, thereby simulating thermal motion. Too often users of computer models lose sight of the fact that protein molecules in living systems are constantly flexing due to thermal motion. Sculpture of human neutrophil collagenase by Byron Rubin on permanent exhibition at the Smithsonian Institution, Washington DC USA. Image copyright © 2001, Byron H. Rubin, with permission. Height: 11 inches. Molecular sculptor Byron Rubin at work. Image copyright © 2001, Byron H. Rubin, with permission. Shortly after conceiving the idea for his Bender, crystallographer Byron Rubin realized that the machine used in Midas Muffler shops to customize automobile tailpipes operated on a similar principle, but at larger scale. He collaborated with the local shop to construct a backbone sculpture of rubredoxin about 5 feet high from stainless steel tailpipe. 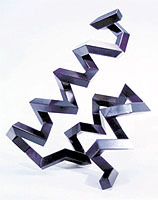 Rubin's rubredoxin sculpture (not shown) won the Chandler competetion at the University of North Carolina in 1973, and since then has stood in the lobby of the Paul M. Gross Chemistry Building at Duke University, Durham NC USA. 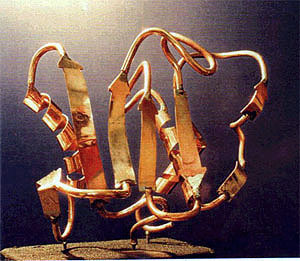 In the mid-1990's, Rubin resumed the creation of molecular sculptures such as the collagenase ribbon model shown at left. 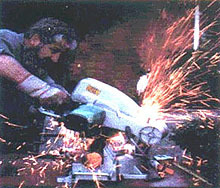 Larger sculptures are under construction in Rubin's workshop near Rochester, NY, in 2001. "Mating Pheromone" (2003), painted steel, 0.9 meters, © Julian Voss-Andreae (used with permission). 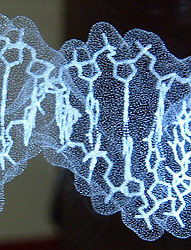 Bathsheba Grossman renders proteins within glass blocks -- see photos below. Julian Voss-Andreae makes large protein sculptures in metal and other media (see photo at right). Edgar Meyer makes molecular sculptures in wood, using a computer-controlled milling machine. Kenneth Eward offers a Gallery of Virtual Sculpture and Photography. 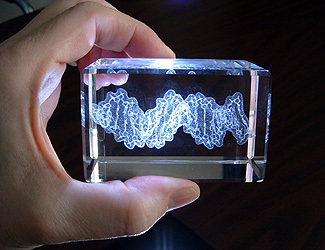 Sculptor Bathsheba Grossman makes "laser crystals" in which the macromolecule (DNA double helix shown at left and right) is represented by tiny laser-induced fractures within a glass block. See crystalprotein.com. Light-harvesting complex II, built at the SDSC Tele-Manufacturing Facility and painted by hand. ATPase, a molecular motor, built at the MSOE Center for BioMolecular Modeling and painted by hand. Courtesy 3D Molecular Designs. 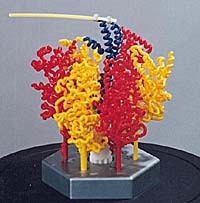 In the late 1990's, efforts were begun independently by Michael Bailey (San Diego Supercomputer Center) and Tim Herman (Milwaukee School of Engineering) to use the new engineering technologies of rapid prototyping for building physical models of proteins. 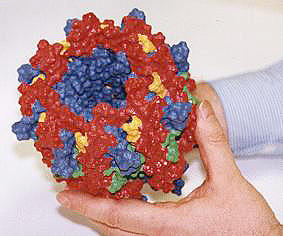 Custom models of research quality became available in 2000 from 3D Molecular Designs. In 1965, Carroll K. Johnson, of Oak Ridge National Laboratory, released ORTEP, a program to produce stereoscopic drawings of molecular and crystal structures with a pen-plotter. See the ORTEP page for more details. In the mid 1970's, a protein structure was solved crystallographically and visualized entirely with computers for the first time (without building a physical Kendrew model) by David and Jane Richardson and colleagues (Beem et al., 1977, Metal sites of copper-zinc superoxide dismutase, Biochemistry 16:1930). They used a density-fitting computer system called "GRIP" at the University of North Carolina (Tainer et al., 1982, J. Mol. Biol. 160:181). In the late 1970's, more and more crystallographers made the transition to building models for newly solved protein crystals with computers ("electronic Richards' boxes") rather than with physical Kendrew-style models. One of the large advantages was that the computer kept track of the atomic coordinates, whereas atomic coordinates had to be measured manually from a Kendrew model, atom by atom. A history of electronic Richards' boxes and the four computer systems most widely used at this time is available in Michael J. Connolly's Molecular Surfaces: A Review in the Computational Chemistry section of the NetWork Science website. In 1977 a wireframe Atlas of Macromolecular Structure was published. Also in the late 1970's, Thomas K. Porter [then of the Division of Computer Research and Technology (DCRT), NIH] developed computer algorithms for shaded spacefilled representations. These developments revolutionized the visualization of macromolecules but were available to a limited number of specialists with access to the most powerful computers of the time. A brief history of molecular graphics, with many more references, is available in the chapter "Part 4: Molecular Graphics" in Michael J. Connolly's Molecular Surfaces: A Review in the Computational Chemistry section of the NetWork Science website. This Taylor Merchant type 101 cardboard viewer, which can accomodate stereo pairs of slides, was included in the TAMS package. DCRT (see above) found it to be prohibitively expensive to publish an atlas of computer-generated, spacefilled images in color. A breakthrough occurred when they learned of an inexpensive cardboard viewer for stereo slides, which would accomodate a pair of 35 mm slides in 2x2 inch mounts. This viewer folded flat for convenient enclosure in the cover pocket of the 3-ring binder in which TAMS was distributed. Satisfactory stereo projection was obtained by using two conventional slide projectors with polarizing filters, each viewer wearing polarized glasses. Human IgG 'DOB', alpha carbons only. Carbohydrate turquoise, light chain yellow, heavy chains red and blue. (p. 63, image pair 5.1.4, slide number 514). Regrettably, the colors in this scanned image do not do justice to the quality of the original. "As you look at the stereoscopic views you will see beauty beyond any previous experience. We feel that the sense of beauty adds a force to the perception of macromolecular structure and function which will make it possible for you and your students to understand macromolecules as they really exist." The TAMS teaching unit was published in 1980, and included sections on the peptide bond, alpha helix, beta structure, tertiary structure, quaternary structure, prosthetic groups, and active sites. The TAMS unit included 116 stereo pairs of color slides illustrating these sections. A student viewer (Taylor Merchant's patented Stereo 7) was provided, along with 7 pairs of images for each of these sections, representing a 49-image subset of the full 116. Each image was accompanied by a paragraph of description, and a study question (answer provided!). The slide-images were constructed using a frame buffer which had one byte of memory (256 colors only!) for each pixel on a CRT screen. The frame buffer purchased by NIH for making the TAMS images cost $65,000, but a few years later, the price had dropped to $12,000. hydrogens = same color as atoms to which attached. During the 1980's, the most popular computer system for crystallographers was manufactured by Evans & Sutherland. These computers, costing about $250,000 in 1985, displayed the electron density map, and enabled an amino acid sequence to be fitted manually into the map. The color display showed a wireframe rendering of the amino acid chain, and could be rotated in real time. These systems used scalable vector graphics. Rapid rotation was accomplished with three hardware matrix multipliers (one for each dimension, X, Y, and Z). The software package most often used on E&S computers was FRODO (now evolved to Turbo-FRODO). FRODO was originally written by T. Alwyn Jones (1978), and ported to E&S computers by Jones, Ian Tickle, and later many others (see the account by Connolly). A team led by Jones later wrote the program O, popular with crystallographers in the 1990's. We are seeking screenshots from E&S systems of the 1980's to include here. Please contact E.M. if you can contribute some. MAGE's animation of deoxy to carbonmonoxy transition of heme in hemoglobin (Protour8.kin). After 25 cycles, animation will stop. Reload to reanimate. During the 1980's, David and Jane Richardson pioneered computer graphic representations of molecular structure with a series of programs developed at Duke University. In the late 1980's this led to a program called CHAOS written in Evans and Sutherland PS300 function-net language (Richardson & Richardson, 1989). In 1992, the Richardsons described the kinemage (from kinetic image), and their supporting programs MAGE and PREKIN (Richardson & Richardson, 1992). By virtue of its implementation on the Macintosh, this was the first program which brought molecular visualization to a large number of scientists, educators, and students. The programs were described in the lead article in the first issue of the journal Protein Science (early 1992), and the program itself was provided on a diskette which accompanied that issue. This article also included instructions for using the program PREKIN together with MAGE for authoring new kinemages. In the subsequent five years, over a thousand kinemages were authored to accompany articles in Protein Science. A large portion of these were authored or edited by Jane Richardson. "Kinemages are set up to illustrate a particular idea about a three-dimensional object, rather than neutrally displaying that object; they incorporate the author's selection, emphasis, and viewpoint ...."
This is at once the great strength of kinemages, and at the same time left a need for a program to allow entirely self-directed, "neutral" interactive exploration of any available structure -- a need filled by RasMol. RasMol also provided a much richer set of renderings, including spacefilling rendering, complete with options for shadowing and reflective surfaces. Oxy-hemoglobin zooming in to oxy-heme (from 1hho.pdb by B. Shaanan). This is an animated picture; unlike with RasMol or Chime, you cannot move it with your mouse. In 1989, while a computer science undergraduate student at Imperial College, Roger Sayle became interested in the problem of depth perception for computer representations of solid objects. His goal was to write a shadowing program (ray-tracing algorithm) fast enough to allow rotating the shadowed image. He managed to write the second fastest sphere-shadowing program in the world! However, at this stage it did little else, and it required a specialized parallel-processor computer. In 1990, Roger entered graduate school in computer science at the University of Edinburgh, where he continued to develop his program under the mentorship of crystallographer Andrew Coulson. Further improvements in the speed of the shadowing algorithm made interprocesser communication rate-limiting on the parallel-processor computer. This enabled Roger to implement it on single-processor computers such as unix, and later Windows and the Macintosh. Roger developed his program into a much more complete molecular visualization system, and by 1993, it was being used in teaching and for images in research publications. Roger generously made the program available to the world scientific community free of charge when he received his Ph.D. in June, 1993. In January, 1994, Roger was employed by GlaxoWellcome, which supported the continued development of RasMol freeware, including the first version for the Macintosh, for the next two years. Roger ceased active work on public versions of RasMol in 1997, but in 1999, Herbert Bernstein et al. collaborated to produce RasMol version 2.7. The name "RasMol" is derived from Raster (the array of pixels on a computer screen) Molecules. Roger notes that the fact that his initials are R.A.S. is probably coincidental. The fact that Roger generously placed the C language source code for RasMol in the public domain allowed others to adapt the program to additional types of computers, and to incorporate RasMol's wonderful user interface and renderings into derivative programs. Such derivatives include notably MDL's Chemscape Chime and Molecular Simulations' WebLab. RasMol is very widely used throughout the world. It is difficult to estimate the number of users, but they likely exceed one million. RasMol is especially popular with students, and in locations where resources do not allow the purchase of expensive commercial molecular graphics software. For more detail, see Roger Sayle's Personal History of RasMol. Recent publications on RasMol are listed in our RasMol & Educational Molecular Visualization Bibliography. Bryan van Vliet and Tim Maffett at MDL Information Systems, Inc. spearheaded the development of Chime (CHemical mIME), a visualizer in the form of a Netscape Navigator plug-in. Chime uses an adaptation of the rendering and command-language from Roger Sayle's RasMol. About 16,000 lines of Sayle's source code were converted to C++, made reentrant, and built into Chime. To this, MDL added more than 80,000 lines of original code to create Chime version 1.0. Franklin Adler, Jean Holt, and others completed the development of Chime 2.0 at MDLI. Chime 1.0 was released late in the evening of 12/31/97, and Chime 2.0 on November 3, 1998. Chime was first made available as a beta pre-release in February, 1996. Some of the first Chime-based molecular structure presentations to appear on the web were by Henry Rzepa and David Marcey. The Navigator + Chime combination offered many advantages over RasMol for educational presentations of chemical structure. By early 1997, various authors had developed Chime-based presentations on 30-some molecules and made them available on the web. Subsequently, Chime interfaces were developed which can load any molecule and apply specialized routines to it, or provide a RasMol-like command line permitting any operation of which Chime is capable on any molecule. These developments are summarized in What is the purpose of the Protein Explorer?, a document which accompanies the Protein Explorer. The list below does not include all references cited above: citations above linked to PubMed or to other web sites are omitted below. I am indebted to the historical chapter by Feldman & Bing in TAMS, from which many of these references were taken. Kendrew, J. C., et al., A three dimensional model of the myoglobin molecule obtained by x-ray analysis. Nature, 181:662-6, 1958. Richards, Frederic M. The matching of physical models to three-dimensional electron-density maps: A simple optical device. J. Mol. Biol. 37:225-230, 1968. Katz, L. and C. Levinthal, Ann. Rev. Biophys. Bioeng. 1:465-504, 1972. Tsernoglov, D., G. A. Petsko, J. E. McQueen, Jr., and J. Hermans, Science 197:1378-81, 1977. Feldmann, Richard J. "Atlas of macromolecular structure on microfiche", Tracor-Jitco, Rockville MD, 1977. Jones, T. A. "A graphics model building and refinement system for macromolecules." J. Appl. Crystallogr. 11: 268-272, 1978. Britten, E. G., J. L. Lipscomb and M. E. Pique, Computer Graphics 12:222-7, 1978. Diamond, R. "Bilder User's Manual", Laboratory of Molecular Biology, Cambridge, England, 1978. Diamond, R. "Proceeding of the International Union of Pure and Applied Biochemistry: International Symposium of Biomolecular Structure, Conformation, function, and Evolution", Madras, India, Pergamon Press. Porter, Thomas K., Computer Graphics 12:282-5, 1978. Feldmann, Richard J., David H. Bing, B. C. Furie, and Bruce Furie, PNAS US 75:5409, 1979. Richardson, Jane S., and David C. Richardson, Principles and patterns of protein conformation. In: Prediction of protein structure and the principles of protein conformation, G. D. Fasman, ed., Plenum Press, NY. pp. 1-98, 1989. CHAOS, a program which preceded MAGE, is utilized in this paper. Click the above visitor count for detailed visitor statistics. Thanks to Rashie Athukorala for digital photography (Bender model of 1LFA) and scanning (TAMS images).